New Blogger Powered Design Showcase! 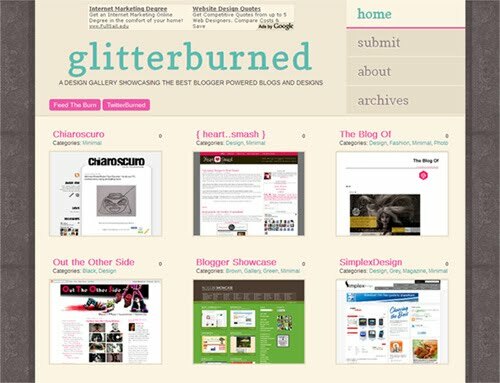 I have just launched GlitterBurned, a gallery showcasing Blogger powered designs. All of my visitors and fellow bloggers' are cordially invited to browse the gallery, and of course, to submit their Blogger powered blogs to the gallery if they would like. The blog is still in it's infancy, but I decided to go ahead with the launch in hopes that I can better craft it to suit the needs of visitors as well as contributors. Above all, I hope the gallery will serve as a resource for inspiration, with a growing collection of Blogger powered gems. Permalink: New Blogger Powered Design Showcase!